And with that, another birthday has come and gone, and we’re five weeks into sixth grade. Softball is over (the Yankees ended the regular season tied for second and won the postseason tournament). Dance (just tap) started three weeks ago and WHOA they are doing some hard stuff. Skating in the “Junior Club” class starts tomorrow afternoon. Shoshanna freaked out her class by including the “little old man” picture in her “All About Me” presentation. She is learning the challenges of playing her violin with the full 5th and 6th grade string orchestra (“I get lost on the parts I’m not as good at yet!”) and we had to break down and buy her the biggest student backpack that LL Bean sells just so she can schlep all of her homework around. Shoshanna’s been at camp a week and we’ve already had more meaningful communication from her in that time than we did in the whole two weeks she was away last summer (two postcards, one with actual content, plus some updates crammed into the blank space on a mad libs mailer). 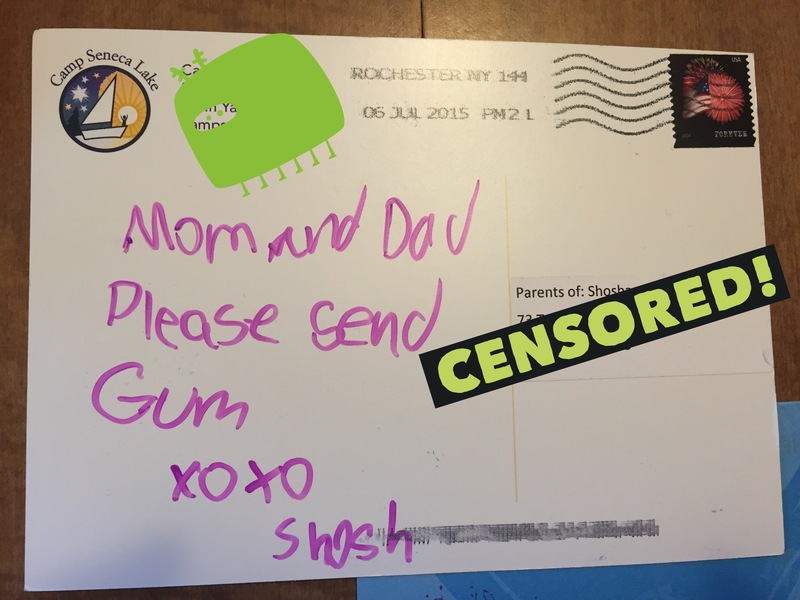 The most important thing, though, is that we should PLEASE SEND GUM. A couple of weeks ago Shoshanna brought home the list of she is supposed to choose three books from for her summer reading. It was … eclectic. 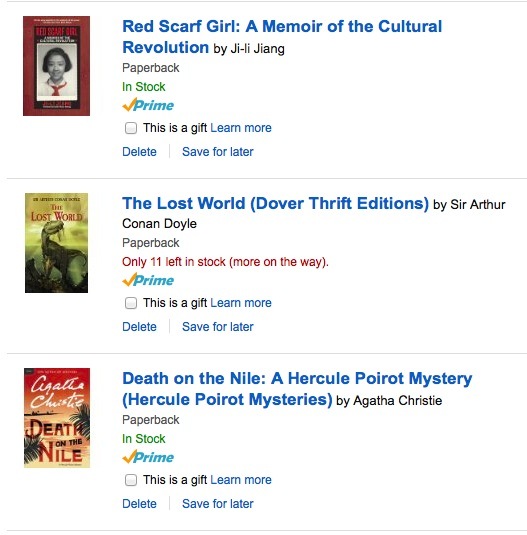 Which is nothing on the eclecticism of the books she chose. 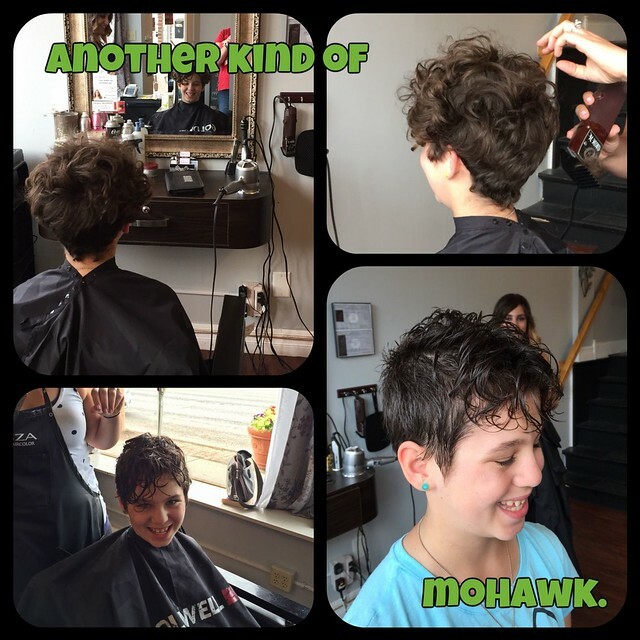 Shoshanna’s world is currently a world of mohawks, in more ways than one. 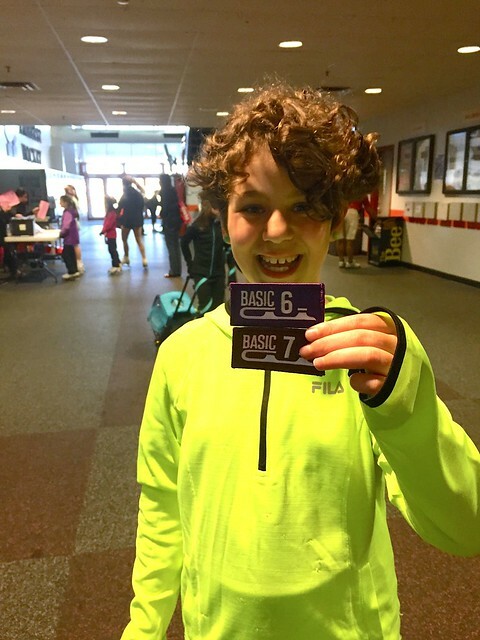 On Thursday she went into her skating class very close to passing both USFSA Basic Skills levels 6 and 7 in one class session (kind of… they throw all the level 5-8 kids into one class, so she’d been working on some level 6 skills since January…). At the beginning of her 25 minutes of instructional time, in the penultimate class of the session, one move stood between her and passing level 7: the dreaded inside mohawk. So that’s one mohawk licked. (I do have video of her doing it, but it’s chock full of video of other people’s kids, so you’ll just have to take my word for it that she’s got it down on both sides.) She has one more week of class so I don’t know what they’ll be doing this Thursday. That’ll be her last skating class until the fall, when she’s planning to enroll in the club’s “Shining Stars” program, which is more intensive group lessons for kids in levels 5-8. After level 8, stuff starts to get real and we have to look at contracting privately with a coach (facilitated through the club) if she wants to really pursue figure skating. So that’s the second mohawk. Apparently her homeroom/math teacher was slightly scandalized, more by the color than the cut. But she loves it and I think if anybody can rock a teal mohawk, it’s my kid. *It should be noted that I had actually been advocating for the mohawk all along. 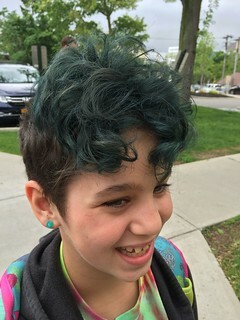 And the color is semipermanent, though we used more and left it on longer than we have any other time, so who knows how long it’ll stay bluish. Somehow I never posted about Shoshanna’s skating lessons last year. After pestering us for quite a while about it, she started doing the Basic Skills program at one of the nearby rinks last January. She passed Level 1 easily and at the start of her second session, the tested her on the Level 2 skills (at my request – I was pretty sure she could do them all) and bumped her to Level 3. Fast forward to the week before Thanksgiving – at the end of the fall session, she’s passed Level 4 and this weekend she’ll be skating in the club’s winter ice show (which is … a production). …prompted by it being World Prematurity Day yesterday. Birthday hijinks and family visits were lovely. Birthday pictures are here and family visit pictures are here. 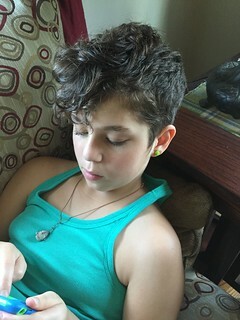 She was Katniss Everdeen for Halloween and the next day she chopped all of her hair off (I’ve been teasing her that she now has the same hairstyle as one of the characters in her current favorite TV show (minus the color, anyway…). She’s loving her piano lessons and she’s skating in her skating club’s Winter Ice Show in a couple of weeks (very much the dance recital of the skating lessons world…). She misses BFF G terribly but she’s making new friends in middle school. 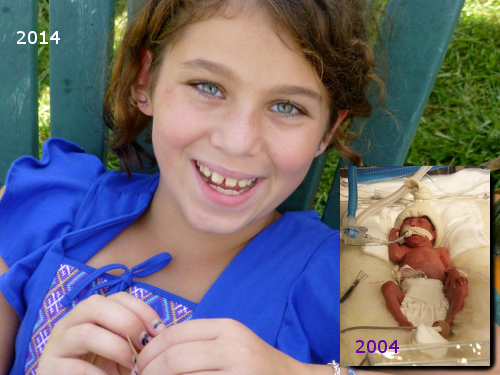 And finally, here’s our nod to World Prematurity Day: Two pictures taken almost exactly 10 years apart. Saturday night there will be three girls sleeping over and two more coming just for the evening. The plan is to decorate picture frames (we will then print party pictures to put in them overnight and that becomes their party favor), eat junk food, have a tinfoil fashion show, and . The birthday outfit (just a blouse this year; Shoshanna now eschews anything with a skirt) is nearly done (needs some seam finishing, a hem, and a wash & press). She says she’s going to wear it to school on Friday. The big present from us is ordered and should be here Monday so I can make sure it’s set up and ready to go when it comes out of the box on Thursday. Little presents from us are new PJ pants and belts (because the birthday blouse requires a belt). Thursday which is, of course, Rosh Hashanah. She’s alternating between being excited that she doesn’t have to go to school on her birthday with being annoyed that the alternative is sitting in temple for a couple of hours. One set of grandparents comes to visit the weekend after the big day and I think the plan is for them to take her out to increase by two the number of holes in her head. The other set comes two weeks later. I’m not sure the world’s ready for the SuperPreemie to be ten.